Shower trays and bases in Quartz and Granite are custom made for your bathroom. Available in any colors from Silestone. Discover our showroom on the north shore of Montreal and Laval. For many of us, our day starts with an early shower. Quartz Shower Trays and custom Granite Shower Bases are great options to add style and value to your house. Select the best of the best, our quartz shower pans are available in different colors, styles and finishes. You can also choose your walls and countertops for your bathroom with the same or complementary color. We also offer standard shower base from Sherlic and Rubi. Granite au Sommet can custom build glass shower doors and walls. Quartz, natural stones and tiles can cover your shower walls. You can also integrated a niche for your bathroom products. We have a variety of stainless steel product in different sizes. It can be covered with your quartz, granite or porcelain. 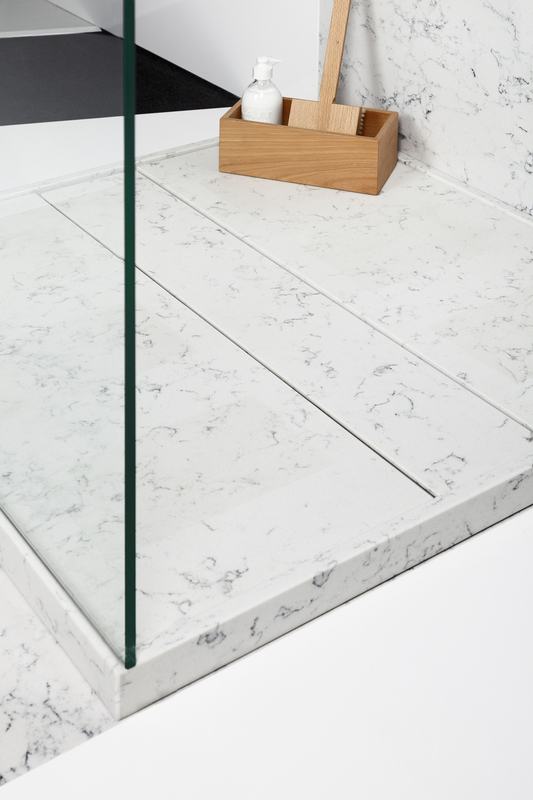 Our shower trays and bases are available in quartz, granit, marble and Dekton. They offer a beautiful look to your bathroom. Visit our showroom today to discover the different options available for your next shower tray. You will find at Granite au Sommet, a wide selection of colours for your Quartz Shower Tray and Granite Shower Base in our showroom on the north shore of Montreal and Laval (Blainville, Boisbriand, Lorraine, Rosemère, Mirabel).